I don’t want to be left alone with Marc Quinn’s History Painting. Taking place at BOX Freiraum, a small gallery space in Friedrichshain, the 51-year-old British artist’s first solo Berlin exhibition consists of a series of tapestries, several paintings, and a bronze sculpture. It’s one of the most unsettling shows I’ve ever seen. Unlike typical tapestries, Quinn’s woven images hang suspended from the ceiling, and also flat on the floor, so that visitors can walk over them. Despite being based on press photos of riots and revolutions in varying places over the past two decades, all the images look more or less the same. The fire in the background inevitably becomes the focal point of every tapestry, stripping away context, consuming everything. The bold yellows, oranges and blacks of the tapestries are visually arresting, sure, but what makes History Paintings frightening is Mirage. 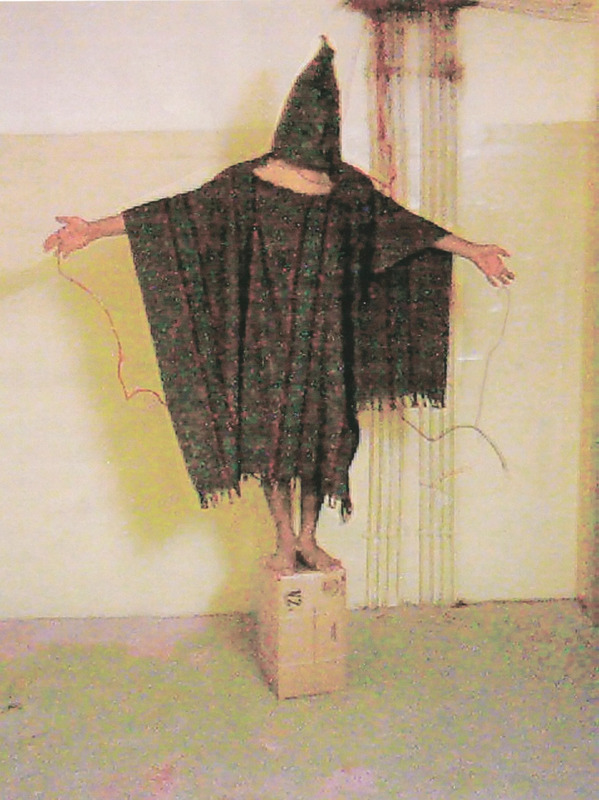 Based on an iconic photo of a victim of torture at the hands of US Army personal at the Abu Ghraib prison in Iraq, the 2009 sculpture is uncomfortably lifelike, reproducing the man from the photo in horrifying detail: the same hooded head, identical fringed prison blanket draped over his body, ominous electric wires spiralling out from outstretched hands. The hooded man almost appears to be swaying slightly with the effort of remaining stationary on that small box, for countless hours, electrodes in his palms like the nails in the hands of Jesus. The resemblance to Christ on the cross, whether intentional or not, is uncanny, but the hooded head is also reminiscent of a Ku Klux Klan member, or a participant in a bizarre pagan ritual. Or a child’s drawing of a ghost. The piece feels like an actual mirage, or a hallucination: that is, it is terrifying to accept that it real. Popular up until the increased prevalence of photography in the 20th century, history painting recorded epic events from mythology, religion, and war. The works here deviate from tradition in that they are made of many tiny threads rather than paint, and they are based on press photos. Yet, like all history paintings, Quinn’s will be rendered almost completely apolitical by time. No matter how important the moments he’s memorialised might have been (or might still be today), time will absorb them all. In Newsclouds, a brand-new series, and the only actual paintings in History Painting, Quinn juxtaposes fluffy white clouds with ticker tape-style headlines about various horrifying news events (and one announcing an Oscar win). The paintings are based on digital photos Quinn took of the sky on the dates of the news broadcasts. Considered on its own, Newsclouds is incredibly obvious. We all know that terrible things happen under lovely blue skies. Anyone who’s ever consumed Western media has got to be pretty used to seeing the horrific juxtaposed with the banal. However, as with the other series in History Painting, Newsclouds has more to offer. 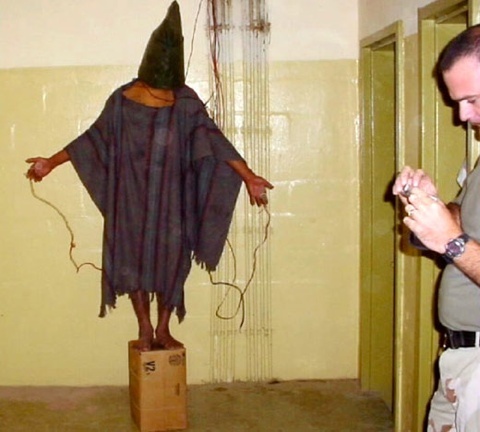 Abu Ghraib’s most iconic victim, the hooded man has come to symbolise the horrific torture that happened there, the many crimes which may begin to slip away from the public consciousness. A New Yorker piece about the prison quotes one of the soldiers involved trying to re-write the history, describing the pose as a joke, and insisting that the wires were not actually live. Like the fall of Icarus, or Abu Ghraib’s hooded man, Quinn’s history paintings represent only a tiny part of a much larger story: one which will in any case be forgotten as time passes, like a tapestry wearing away as people walk over it.